When in New Orleans, do as the New Orleanians do – eat well. Do that even when the visits are brief. NEW ORLEANS – When in New Orleans, do as the New Orleanians do – eat well. Do that even when the visits are brief and you have only two lunches, one breakfast and one dinner in which to indulge your tastebuds. This culinary jaunt through the Big Easy begins with lunch one day and ends with lunch the next day – four grand opportunities for memorable meals and locations. 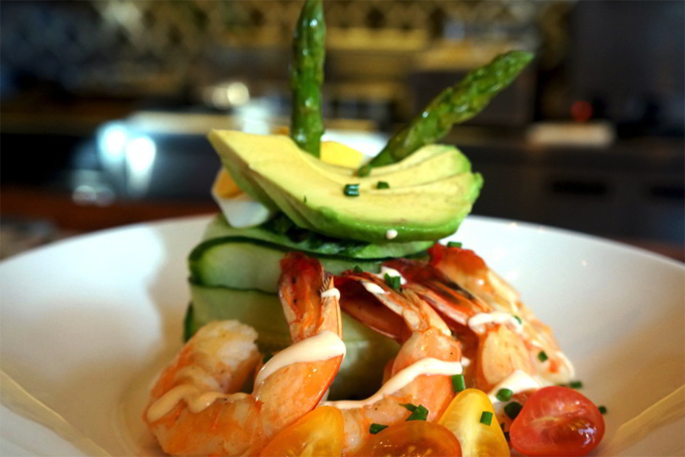 Gulf shrimp, avocado, blue crab and asparagus become very edible art at Criollo; image by Hotel Monteleone. The Hotel Monteleone is a New Orleans treasure in the heart of the French Quarter. The hotel, family owned for five generations, dates to 1886 and has sheltered and fed luminaries such as William Faulkner, Tennessee Williams, Ernest Hemingway and John Grisham. Its restaurant is Criollo (Spanish for “creole”), where the menu reflects the city’s many culinary cultures. Hints of Spain, Italy, France, the Caribbean and Africa influence the tempting options. The setting is quiet and refined, but certainly not stuffy, and the service is professionally attentive. One artistic appetizer selection is a circular stack of Gulf shrimp, blue crab and avocado accented with spicy tomato coulis. It could almost be a meal by itself, but that’s not wise when lunch entrees include sautéed gulf redfish, jumbo lump crabcakes and pan-seared diver scallops. The entrée-sized crawfish beignet is on the appetizer menu at Katie’s. Image by Tom Adkinson. Exit the streetcar at Iberville Street, and walk one block into the neighborhood to find Katie’s. At night, its lights are a beacon pulling you into a clattering, happy place you’d never know suffered a five-year knockout punch from Hurricane Katrina. Prices are modest. 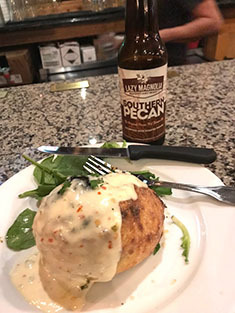 Classic lasagna is $15, catfish meuniere is $18 and the crawfish beignet (where else but New Orleans will you find a crawfish beignet) is $14. The crawfish beignet is on the appetizer menu, but don’t be fooled. It’s a complete and memorable meal, especially if you add a side salad. Local travel writer Beth D’Addono swears by Katie’s cochon de lait (suckling pig) sandwich in her book, 100 Things To Do in New Orleans Before You Die. The décor at a Ruby Slipper Cafe is basic, but the food will make you brag about your fancy breakfast. Image by Tom Adkinson. 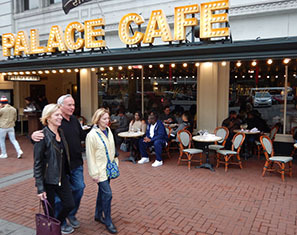 There is a constant parade on Canal Street if you choose a sidewalk or window table at the Palace Cafe. Image by Tom Adkinson. Whether you need a solid breakfast before a day of sightseeing or a sobering breakfast after a too-late night, easing into a Ruby Slipper Cafe will fill the bill. These are restaurants with a mission – serve breakfast, brunch and lunch and then call it a day. Yes, you can get plain pancakes or scrambled eggs and dry wheat toast, but why do that? You’re in New Orleans, so order something special. For instance, try Shrimp Boogaloo Benedict (Gulf shrimp sautéed with tasso ham and creole tomato sauce over fried green tomatoes, a buttermilk biscuit and two poached eggs) or Grilled Fish St. Peter (grilled fish served on a cheesy grits cake, topped with sautéed spinach and tomatoes, a skewer of grilled shrimp and finished with creole mustard hollandaise sauce). The first Ruby Slipper opened in the Mid-City neighborhood in 2008 while New Orleans still was in recovery mode from Hurricane Katrina. A blighted corner store became a locals’ favorite, and other New Orleans locations followed. The idea now has spread to Baton Rouge, Mobile, Orange Beach, Ala., and Pensacola. Art on the walls complements art on the plates of the Palace Cafe, a favorite on Canal Street. Image by Tom Adkinson. 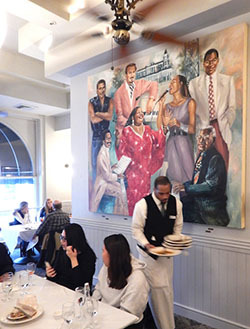 The Palace Cafe is just around the corner from the sedate Criollo in the Hotel Monteleone, and it, too, offers some classic New Orleans dishes but in a hustle-bustle, noisier-but-still-fun atmosphere. It faces Canal Street, and tables at the windows or on the sidewalk provide a panoramic view of streetcars, shoppers and tourists from around the world. A curving staircase leads to balcony seating, and vibrant New Orleans murals add to the atmosphere. 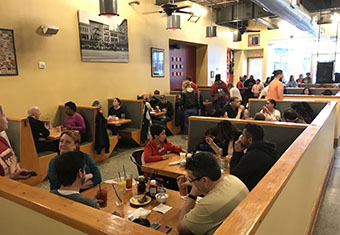 You’ll tell stories about Palace Cafe selections such as turtle soup, seafood gumbo, creole bouillabaisse, pecan-dusted catfish, Andouille crusted Gulf fish or pasta with Gulf shrimp and andouille. After all, you can go back to burgers and fries when you’re back home.